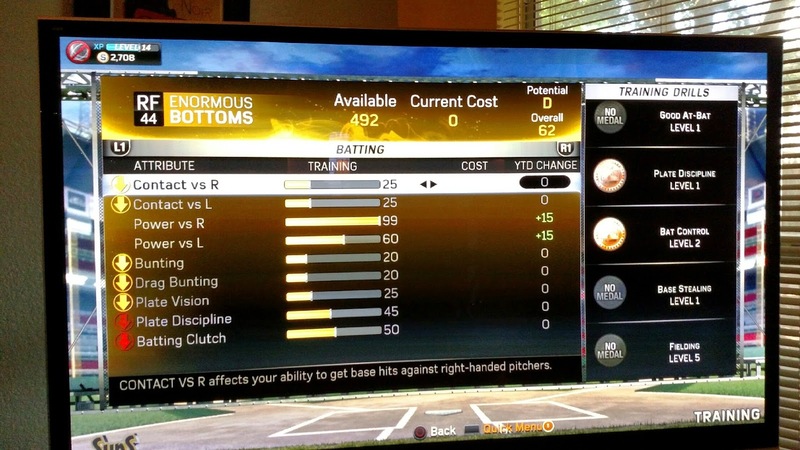 Enormous Bottoms is my character to role play the hell out of Road to the Show. I wanted a guy whose skills were massively unbalanced. So Enormous Bottoms has never sunk one training point into anything else but power. This is a terrible strategy for success. It's an excellent strategy for role playing, though, and there are a ton of guys like EB in real life, big power hitters who strike out a ton and can't field their position with any degree of competence. That's all default ratings, with the exception of power versus right handed pitchers (99) and power versus left handed pitchers (60). 1. A rating category must be improved to 99 before any other category can receive training points (with the exception that if a rating starts to degrade, I will spend points to restore it to its original level). 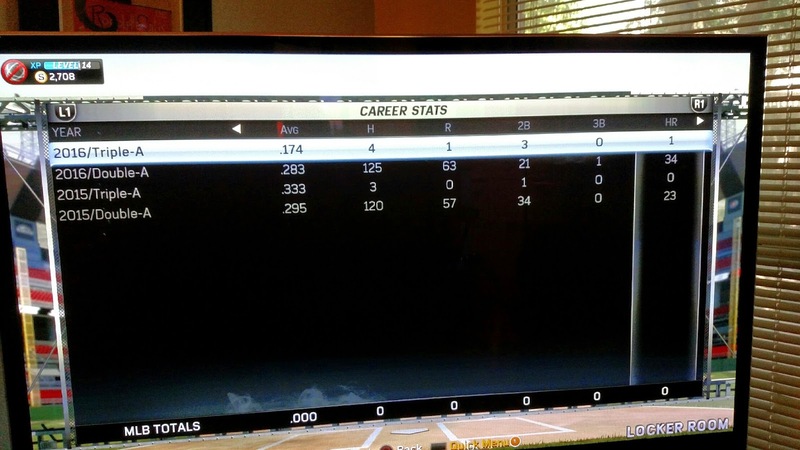 I reached 99 with right handed power, then started on power versus left handed pitchers. Once that hits 99, the next category will be Arm Strength. If you look at that image, you'll see that Contact is 25. So what I wound up with is a massively unbalanced player, which is just what I wanted. He's going to be hugely powerful, hit a ton of home runs, with a massive number of strikeouts. And a cannon for an arm, even though he doesn't catch very well. 2. Every swing Enormous Bottoms takes, for his entire career, is a power swing. No contact swings. No regular swings. He's Dave Kingman, basically, for those of you who remember back that far. 3. No bat adjustments. It's possible to reposition the bat during the swing, to adjust to high/low pitches, but I'll be doing none of that. Instead, Enormous Bottoms has to wait for a pitch in the optimal zone for his swing. If he swings at a low strike or a high strike, he's unsuccessful. So there has to be a ton of plate discipline in terms of pitch selection. That's just what I was hoping for. 58 home runs in two seasons, 164 RBIs, and 250 strikeouts. His line this season is strong: .283 BA, 34 HR (leading his AA league), 90 RBI (leading the league), and 141 Ks. I'm not sure they have league "leaders" in strikeouts, but believe me, he'd be crushing that, too. He almost has as many extra base hits as he has singles. So a typical game for Enormous Bottoms might be 3 strikeouts and a towering home run. 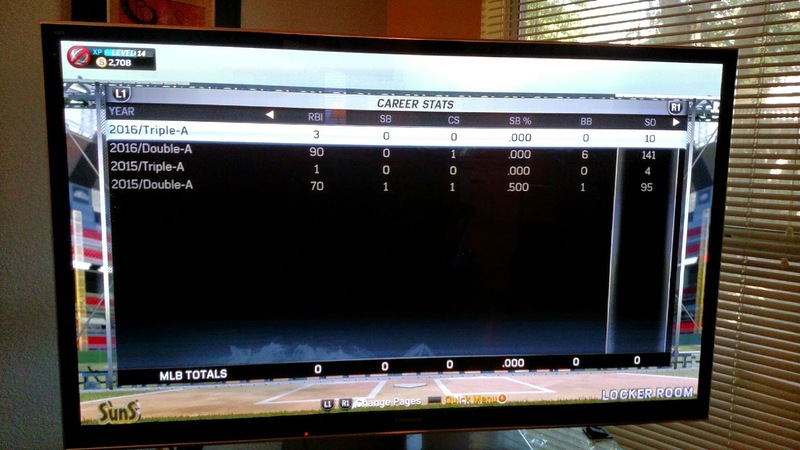 I unintentionally avoided one of the biggest problems (for me) with RTTS mode. Building a player evenly tends to get him promoted too early, because as soon as his overall rating is better than the player in the league above him, he'll get promoted. Playing in a higher league, though, makes it harder to get training points based on performance (because performance will usually go down in a higher level league). Enormous Bottoms, though, doesn't have that problem. He's spent almost two solid years in AA ball, because cranking up one ranking doesn't improve your overall rating nearly as quickly. Plus, I love the minor leagues in this game. They added new ballparks this season, and most of them are terrific. So it's very pleasant to bumble around in the minor leagues for several seasons. Tomorrow, I'll talk about the game design elements of The Show and how they've substantially improved the game this year.